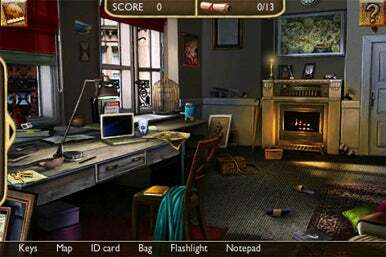 City Interactive’s Chronicles of Mystery for the iPhone or iPod Touch is a hidden picture mystery game that is riddled with software bugs, a complicated plot, dull character dialogue and repetitive gameplay. Do you want to find the hidden objects? Me neither. In Chronicles of Mystery, you play as Sylvie, a young archeologist in search of her missing uncle, a historian/archeology professor. The professor has gotten himself in the middle of a conspiracy involving the Knights Hospitaller, a Christian military group from the Middle Ages. You go from go from one European location after another in search for clues of his current whereabouts. Locations on your journey include archeological digs, graveyards, courtyards, hotels and the rooms of many, many suspicious people. You get to see each place in the form of a picture. Somewhere in each picture are hidden items helpful for your professor search. At the bottom of your screen, you get a list of artifacts you have to look for in the picture. Items you search for can include letters, keys, hammers, weights, cell phones and umbrellas. At a locale, if you come across an item on the list, all you have to do is tap your finger to it to pick it up. If an item is intended to be used later, it will be added to your personal items collection. Your collection of items is shown on the left side of your screen. I would have liked to have finished Chronicles of Mystery, as I spent a great deal of time playing it, but I couldn’t. After a few hours of gameplay (I am surprised I held on that long), I reached a hotel level that seemed impossible to beat. Turns out, it is impossible to beat, as my internet research informed me the level has several software bugs that have caused some players to have to restart the game. Further research informed me that there are several levels past the hotel level that are also flawed. Occasionally, an artifact you find will give you a solid clue as to what locale you’re headed to next. If an item is a clue (letters are often big clues), rarely do you ever have to do anything, as Sylvie tends to take the lead and the game will automatically take you to where you need to go. Sometimes, items are used to work mechanisms in a location. In one locale, you have to locate an umbrella and a cigar and then use those items to set off a fire alarm. If you find keys in a place, those keys are often used to unlock doors that lead to other locations. From time to time, in the search of an item, you may come across a hidden puzzle. Puzzles may include picking a locked door, balancing a scale with weights, uncovering a hidden message in a letter, or matching colors in a stain glass window. Puzzles will unlock clues as to what the professor is up to. If you complete a puzzle successfully, it will become a mini game accessible for you to play at anytime in the “Minigames” section of Chronicles of Mystery’s main menu. Though mission descriptions can sometimes be lacking, I found most dialogue between characters to be unnecessary and way too long. On your journey, you will come across mysterious people that are in someway related to the professor’s disappearance. When you talk to a mysterious person, he/she will often drag on for long periods of time. After a mystery person’s long speech, Sylvie will often just answer him or her with a short sentence or a word. Sometimes, Sylvie will engage in long dialogues with characters where half the conversation is pointless and could have been reduced to two sentences. The dialogue isn’t just long, its not entertaining in the least, and as the game has been translated to English, it is often poorly translated. The game’s biggest problem is that each level is essentially the same. Sure, there is a different picture representing each European location, but your mission objective in each is identical—find missing items. Often the items are clear as day to find. Only once in a while did I have difficulty locating a missing artifact. I got bored really fast while playing Chronicles of Mystery, but stuck with the game in hopes that it would lead somewhere. It never did, and when I got stuck on the hotel level, I just didn’t have the patience to restart the game and try again.